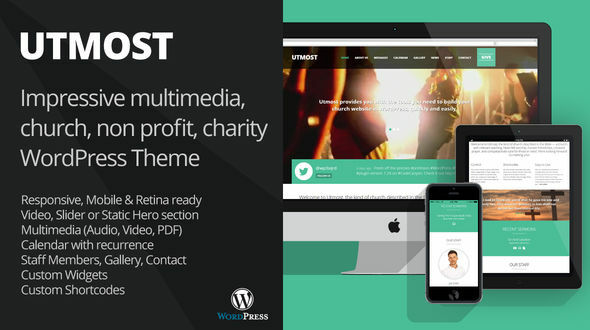 Utmost church theme for WordPress has the features a church website needs. A beautiful, mobile-friendly responsive design, unlimited sidebars for widgets, message archive, photo and video gallery, calendar, staff, news and a contact page. The message archive section has the ability for video, audio and text sermons all while sorting them by category, tag, date and speaker. Utmost is retina-ready and customize your fonts, and color. All this can be done quickly from the WordPress dashboard. Utmost is not just for church websites. It works perfectly for any non profit or company website that needs to publish audio, video and promote events. You can fully rename the message archive in the theme options. Version 1.2 Enhances responsive hero section and mobile menu! This theme is well-documented – organized, easy to follow instructions explaining how to use its features. Additionally, a series of video guides is included and support is provided. The Utmost church theme was designed to be responsive. In other words, it is mobile-friendly and will adapt itself to fit comfortably on devices with small screens such as phones and tablets. Did we mention it’s also touch enabled! Visitors can just flick left and right for sliders and players. Utmost was made to be easy to customize to match your church branding from within the WordPress admin area. You can set a main color change fonts (600+ Google Web Fonts preloaded) and set hero backgrounds as video, image sliders or static images. It is also easy to Upload Your Logo. None of this requires editing code. Put your pastor’s messages online in audio (listen online or download MP3), video (YouTube or Vimeo), online text or downloadable PDF format. This theme provides a robust multimedia archive in which sermons can be organized and browsed by category, tag, speaker, month, day and year. Keep your congregation and community in the know about what will be happening by posting events to the church calendar. Events can include dates, times, address, Google Map and other information. 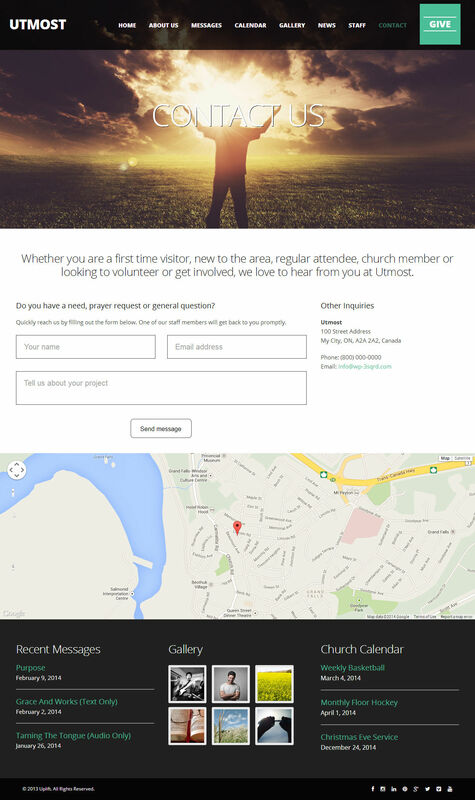 In addition to message multimedia, photos and events, Utmost has features for posting Church News (blog), Staff Profiles, built in event Calendar, Galleries, Twitter feed, and a Contact Form in the footer and on a Contact page. Custom Widgets for Message Archives, Recent Messages, Calendar (upcoming, past), Gallery, Donation and more. If you have a question that is not answered in the documentation or if you discover a problem, you can submit a support request via the form on my Profile Page (must be logged in to see it). My goal is to answer questions within 24 hours on weekdays (excluding Canadian holidays and the rare period of travel). Please note: Support is provided for theme features and problems. Customizations not included. Version 1.2 – Major Update: Enhanced Responsive Hero Section at top of pages, Enhanced Mobile Menu, Disabled animations on mobile, Updated Home text slider to Flexslider, Updated Hero Slider to flexslider. Version 1.06 – Added Visual Composer and Ultimate Addons for Visual Composer compatibility. BiWeekly Recurrence added. Other minor fixes.